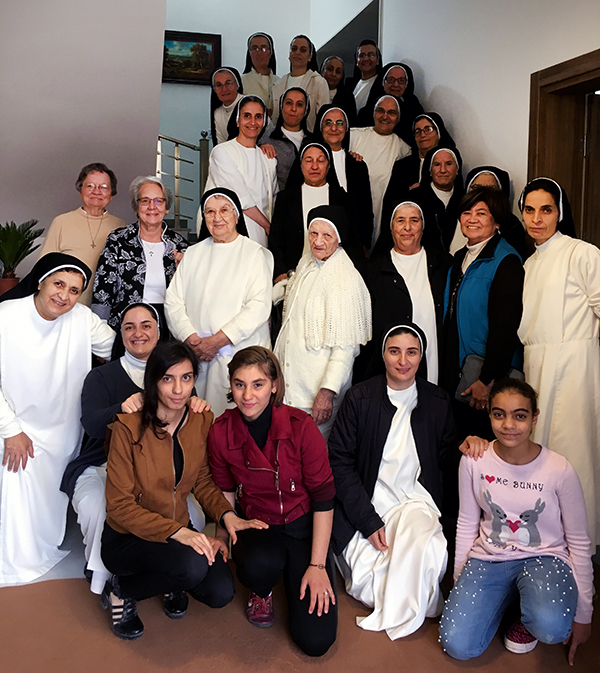 December 5, 2018, Adrian, Michigan – Three Dominican women returned from a visit to Iraq with a greater awareness of the suffering that the Dominican Sisters of St. Catherine of Siena of Iraq have endured as a result of their displacement by ISIS and their struggles since returning to their demolished communities on the Nineveh Plain. The delegation of U.S. Dominicans – Adrian Dominican Sisters Rose Ann Schlitt, OP, and Nancy Jurecki, OP, and Dominican Laity member Gloria Escalona – spent 10 days in Iraq, November 15-24, 2018. They visited many sites, including the displacement camps where the Iraqi Dominican Sisters had lived and the Sisters’ former homes in the Nineveh Plain that had been demolished and abandoned by ISIS. “The schedule was probably the most intense I have lived in recent years, mainly because [the Sisters] did everything with rapidity and intensity,” Sister Rose Ann said. The experience was also heart-wrenching for the U.S. Dominicans, who had a taste of the suffering that their Dominican Sisters from Iraq had endured – both in exile from their homes and in the ruins of the homes to which they returned. Sisters Luma Afreem Khuder, OP, and Nazik Khalid Matti, OP – who had studied in the United States and Europe, respectively – served as translators and guides. Members of the delegation of U.S. Dominican women gather with members of the Council of the Dominican Sisters of of St. Catherine of Siena. The delegation first visited the scene of the displacement of the Iraqi Sisters and thousands of Christians and other minority groups who were forced to leave the Nineveh Plains or face death. The displaced community in Kurdistan had lived in whatever they could find, including thousands of pre-fabricated containers that served as housing. “You’d never believe that people could live in such tight quarters,” Sister Nancy said. Living in exile themselves, the Dominican Sisters served the displaced community as well as possible, establishing schools and health clinics. During their visit, the former camp was practically empty, Sister Rose Ann said. However, they visited the home of an older couple who opted to stay, afraid that their homeland was not yet secure. “There was no electricity and no water – ever,” Sister Rose Ann said. “A couple, probably friends from the Nineveh Plains, had brought them bottles of drinking water and tried to convince them to return home,” but they didn’t feel safe, she added. Immaculate Mary Church, the largest and arguably the most beautiful church in the Middle East, is being reconstructed after the severe damage it suffered. But throughout their journey, the U.S. Dominican women also saw signs of hope and of resurrection through new ministries springing up and through the resilience of the people. Symbolic of the new life, perhaps, is the rebuilding of an altar that had been smashed by ISIS. 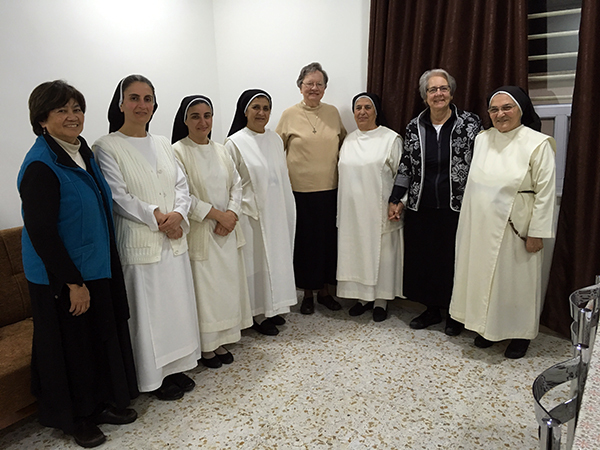 The delegation of U.S. Dominican women and Iraqi Sisters gathered to celebrate the dedication of an orphanage. Another sign of resurrection was the rebuilding of a kindergarten for 551 children in only 40 days. “They cleaned up the place and scoured it,” Sister Nancy said, describing the quick rebuilding of the kindergarten as a “Phoenix arising from the ashes.” Sister Maria Hanna, OP, described it as resurrection. “There’s still so much more that needs to be done,” Sister Nancy added, “but there are islands of hope in terms of what has already be done” to reconstruct the communities. Feature photo (top): U.S. Dominican women who visited Iraq are, from left, Adrian Dominican Sisters Rose Ann Schlitt, OP, and Nancy Jurecki, OP, and Gloria Escalona, a member of the Dominican Laity.